This page was begun in 2003 as a free community service. We invite YOUR scans of local historic images. 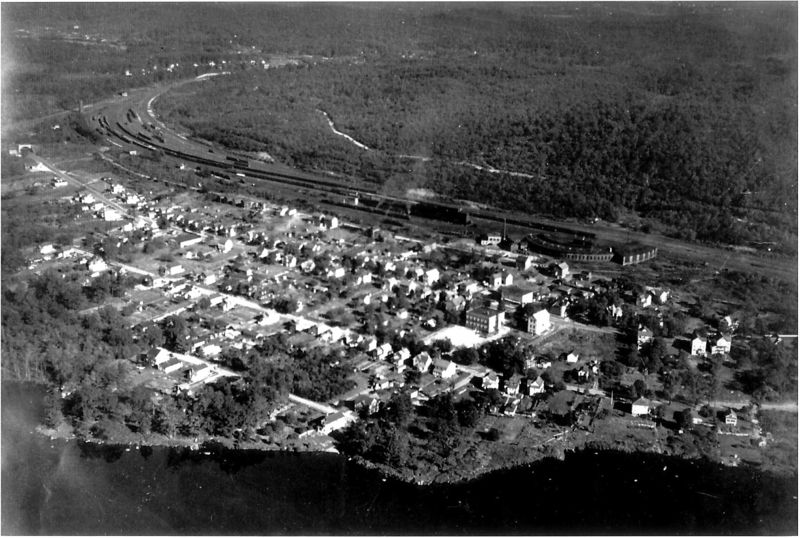 An aerial view of Port Morris, circa 1936-1940. Clearly visible at center right is the Railroad Train Roundhouse. Lake Musconetcong is at the bottom. Netcong is just out of view to the right, Landing is at the top left of photo. 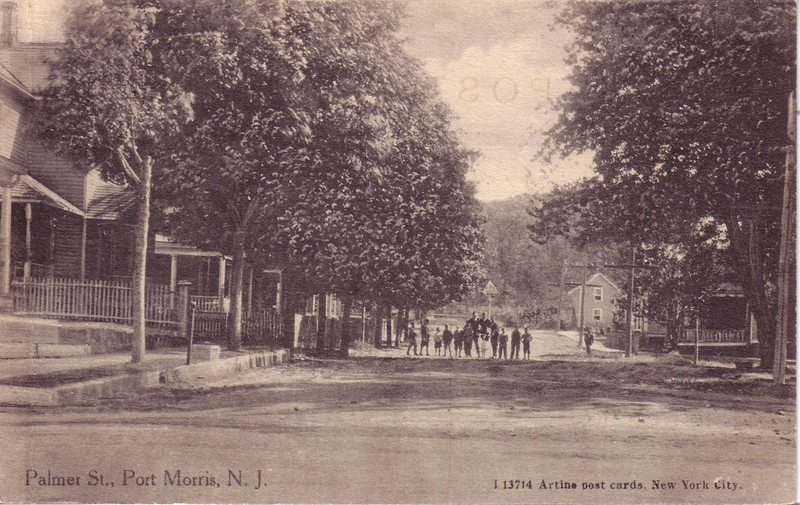 Port Morris is an historic community in the Township of Roxbury, Morris County, New Jersey. With a name like Port Morris, one would think it was on the ocean or a major river instead of being tucked among the hills of Northwest Jersey, away from any navigable body of water. The answer to the question goes back to the 1820's, when a visionary by the name of George P. Macculloch imagined a super highway to move commodities across the hills of Northern New Jersey, particularly Coal from Pennsylvania and Timber from western New Jersey to industries and markets in the cities to the east. Up until then they moved at a snails pace in horse drawn wagons over poor roads, so slowly that the effort to supply US troops during the War of 1812 was impeded. Macculloch envisioned a super highway of water, a canal, that allowed 30 tons of coal to make the journey from Philipsburg New Jersey, near the coalfields, to Newark, Jersey City or New York in just 5 days, an unheard of feat. The Morris Canal was completed in 1830, and little hamlets sprung up along it's route to service the crews and teams of mules that pulled the boats laden with goods. Those little hamlets became towns, and Port Morris was one of them, a major stop, or 'Port', due to it's long inclined plane that pulled boats up the hill, or lowered them, all in massive wooden cradles that held the boats and moved along rails that ran up and down the incline. At Left: Port Morris from the 1887 Robinson's map. Lake Musconetcong is at lower left. The Railroad Roundhouse is the half round structure between the RR tracks and the Morris Canal. The top of this map points east by northeast. a beverage distributor which specialized in Beer and Soda. This building burnt down in the 1930's. A house was built there in the 1950's. Thanks to Pat & Don Beach for this image scan and 2 others below. 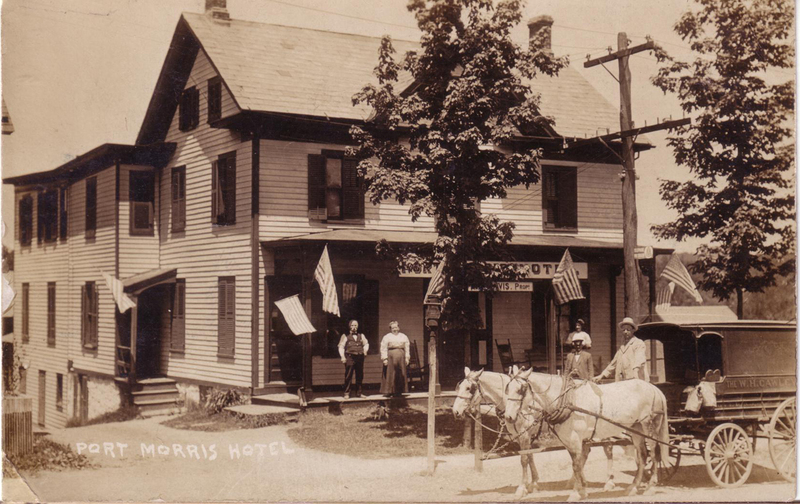 Another image of the Port Morris Hotel, probably a few years later than the top image. 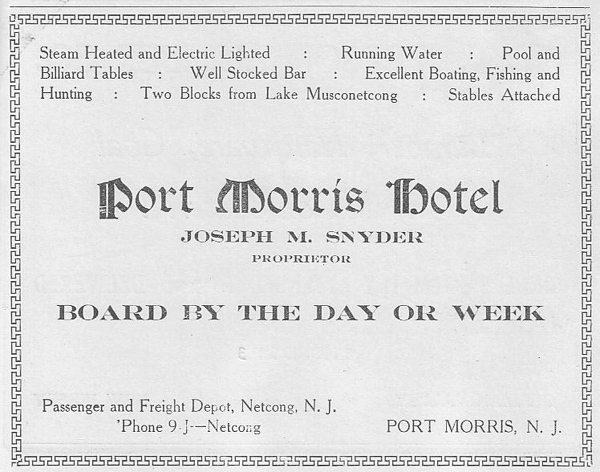 By 1916 the hotel manager was Joseph Snyder. Looking south on Palmer Street, circa 1910. Note at left the hitching post and stepping stone for Horse drawn carriages. start of the words "FURNITURE" and "CANNED GOODS", items seen in their print ads. The home at right was built by the Hulse family. The store building at left burnt down in the late 1960's, the 2 buildings at right still (2012) stand. note new sidewalk, circa 1910. Kids may be same group as Palmer St photo above, same publisher. Center Street, corner of Palmer, looking east, circa 1912. Jonas Hulse house on corner, built c. 1895. Hulse also built the boxy building behind the house, it served as a store and warehouse from which he made deliveries. This is from the same corner as the photo above, except this view is about 50 feet further back. The Thompson Store is seen in the photos above. longer than Rossi & other families that followed. very large house, ie, a Boarding House. It burned down in the 1930's. this circa 1907 photo shows the building a few years after the move across the Train tracks, see history below. Behind it is a glimpse of the original Washington Elementary School. 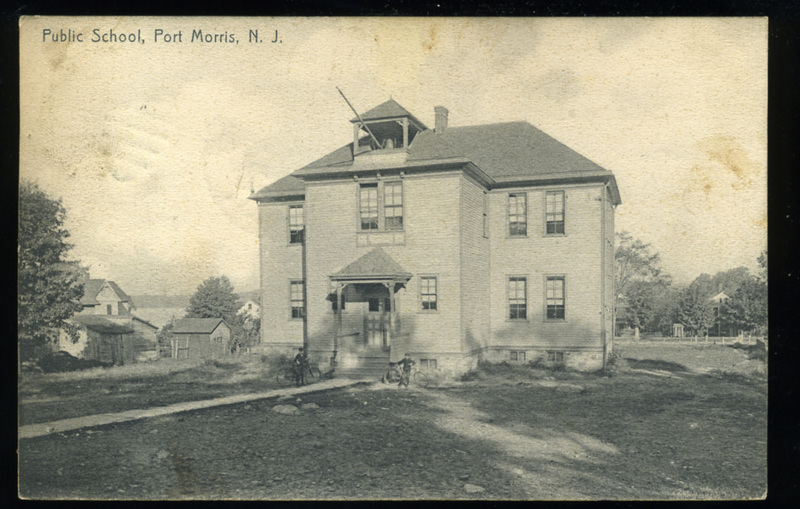 This is a rare circa 1907 postcard view of the Washington School, the original Port Morris Elementary School building built in 1892. It had 4 large classrooms plus offices and a large basement and stood on Center Street. Lake Musconetcong can be glimpsed at left. A different view of the Washington School, the original Port Morris Elementary School building built in 1892. Over 60 students attended the first year. This building was gutted by fire in early 1922, torn down and rebuilt as a larger building, below. This building still stands (2012), having been converted to a private apartment complex. 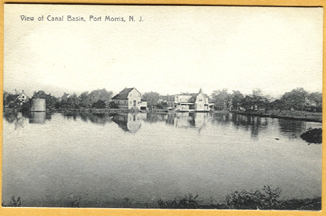 Port Morris on the Morris Canal, circa 1890. To the right in the photo is the Blackwell General Store, it provided supplies to the local residents and the passing Canal Boats. The upstairs of the store was also rented out as a Hotel. This view looks southwest. to allow the mules a walkway as they pulled the Canal Boats, 1903.
in 1928, when lake water levels are low the ridge pokes out of the water. This view looks west toward Netcong and Stanhope. Click here for the history of Netcong and Stanhope NJ. under it has a close-up of the "inclined plane". 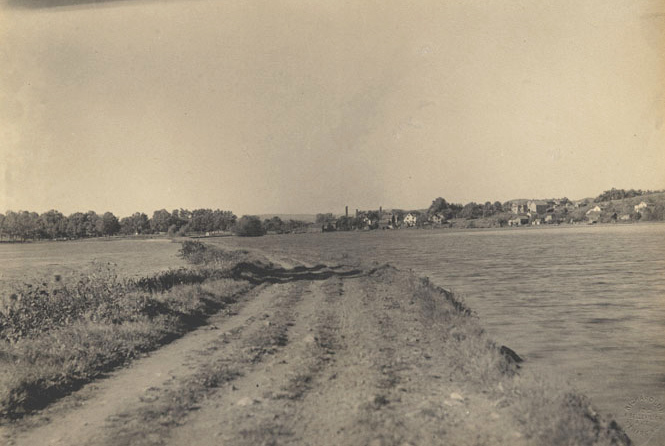 Photo circa 1905, this view looks east. of the Roxbury Township Fire Dept, thanks guys !! Here is the "Canal Basin", at the top of the 'Inclined Plane'. Center St, this is the easternmost one, dated 1910. This view looks east, with Landing in the distance. operated a number of rides & concessions at Bertrand's Island Amusement Park in nearby Mt. Arlington. The De Marino family down across the street. 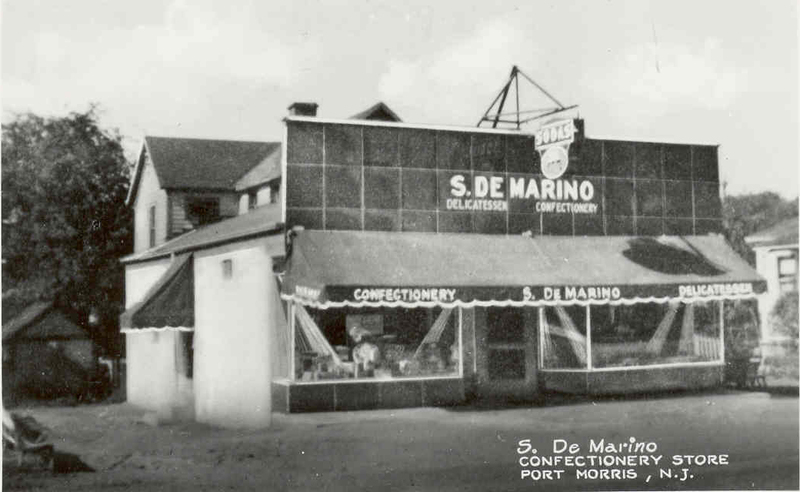 The rise of large shopping centers in nearby communities hurt the small Port Morris stores, De Marino's closed circa 1969, most others by the early 1980's. This building still stands today after extensive remodeling and conversion into 2 residential apartments. The Granato Brothers Service Station, Port Morris, NJ, circa 1948. Photo provided by the Granato Family, Thanks ! Joseph Granato writes: "Before the Garage there was a small movie house of some sort on the property. The deed says we could not show movies on the property anymore. John and Joseph Granato Sr. built the building, they had both worked at Aires Chevy before that. John Granato was in the Navy during the war. My Great Grand Father worked on the railroad. My Grand Father lived at 19 Washington Street. John Granato lived in Mine Hill. My Father moved to Stanhope and that is where I grew up. However as a teenager I hung out with the Port Morris kids. I pumped gas at the station, 3 generations of Granato's worked at the station. They started out with a 3 car shop and then phone company came along and added the large garage in the back. Eventually they moved over to where they are today in Netcong"
The Grananto Bros Gas Station opened around the time of World War Two and closed about 1982. The building was recently renovated and is in use. 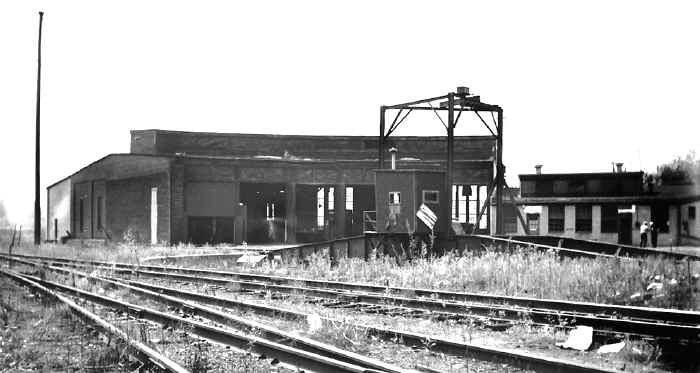 The remains of the Port Morris Railroad roundhouse in 1963. 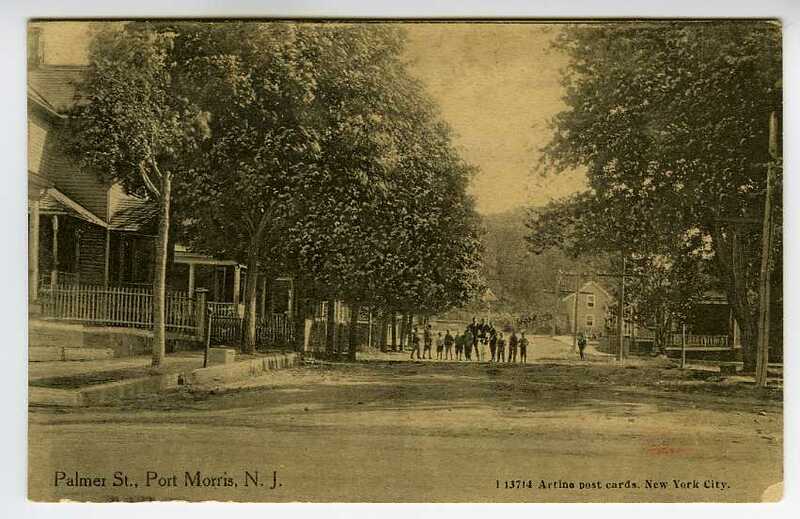 The history of Port Morris, New Jersey is intertwined with the histories of Landing, Lake Hopatcong, Netcong/Stanhope, Roxbury Township and Morris County. In this short overview we will focus on Port Morris, while understanding how these communities were interrelated. 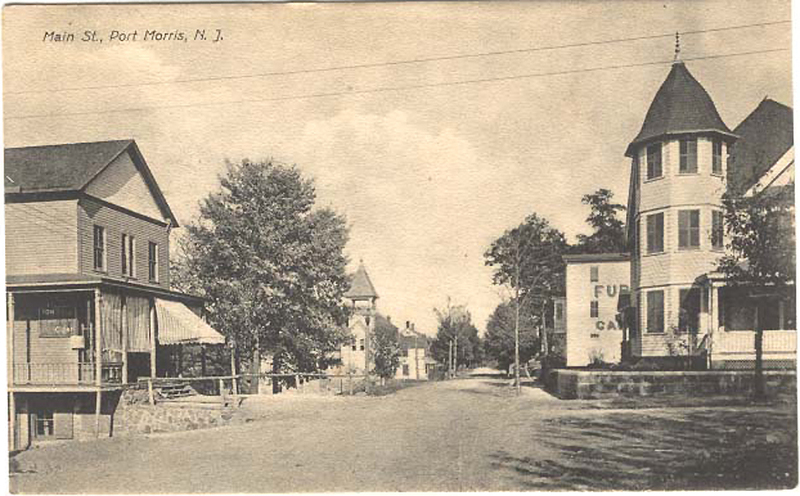 1740 -- On December 24, 1740 Roxbury was incorporated as the fourth township in Morris County. Over the years some of the original land area became independent communities such as Mount Olive and Netcong. Roxbury Township is now comprised of Succasunna (formerly Suckasunny), Ledgewood (formerly Drakesville), Kenvil (formerly McCainesville), Port Morris, Landing and Lower Berkshire Valley. Roxbury Township is just under 22 square miles in size. 1822 - -While fishing at Lake Hopatcong, George P. Macculloch dreamed up the idea of what was to become the Morris Canal. The canal was chartered in 1824 and would be an inexpensive way of moving large quantities of coal, timber, iron ore and other goods across New Jersey. It was the first American canal to climb hills. The Morris Canal would run for 103 miles joining the Delaware River at Phillipsburg with the Hudson River, a mule-drawn barge trip that took about 5 days. Parts of the Canal became usable in 1827, the full length in 1830. Little hamlets sprung up along it's route to service the crews and teams of mules that pulled the boats, Port Morris was one of these, with nearby Ledgewood on the east, and Stanhope on the west, being others. 1845 -- An agreement was made between the Sussex Iron Company in Stanhope and the Morris Canal and Banking Company to manage the water resources of the Musconetcong River. 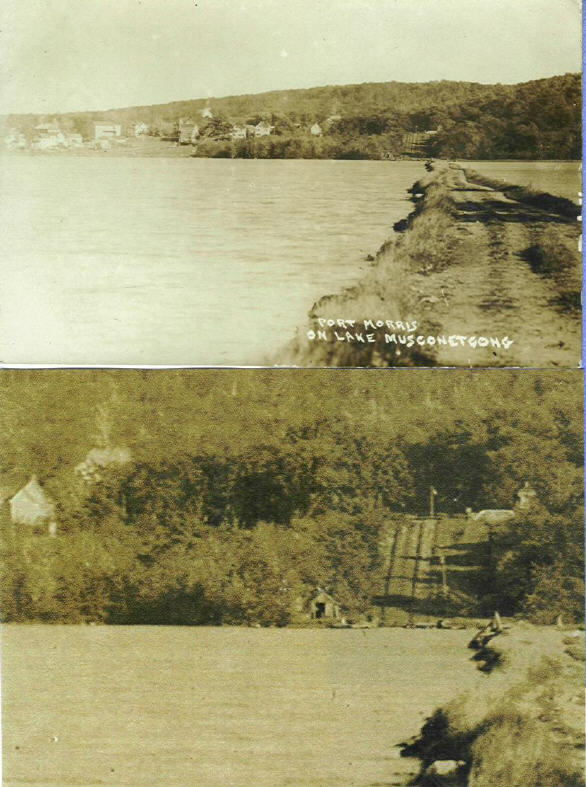 This resulted in the construction of the dam at Netcong/Stanhope that formed a water reservoir, originally known as Stanhope Reservoir, the present day Lake Musconetcong. This provided a source of water power for various industries in Stanhope as well as forming the lake that graces Port Morris. 1850's -- The tracks of the Morris and Essex Railroad (taken over by the Lackawanna in 1868) are laid through the area around 1853, but no station is built in Landing or Port Morris. Passengers going to Lake Hopatcong (very few at this date) left the train at the Drakesville (now Ledgewood) crossing, and were carried by horse drawn carts over the bumpy roads up to the Lake. 1857 -- The Morris and Essex Railroad announce increased service on their Newark to Hackettstown Line, with an official stop in Port Morris. 1860 -- The Canal Locks are enlarged to allow new, larger boats carrying 70 tons, a big jump from the 30 tons boats the canal started with. These boats are enormous, hinged in the middle, forming 2 enclosures. This was an attempt to stay competitive with the surging Rail Industry. 1866 -- The most prosperous year of the Morris Canal as it carried almost a million tons of freight. Among the commodities carried were lumber, coal, and iron ore. The canal's business will now dwindle as the faster railroads start to lure away the canal's customers. 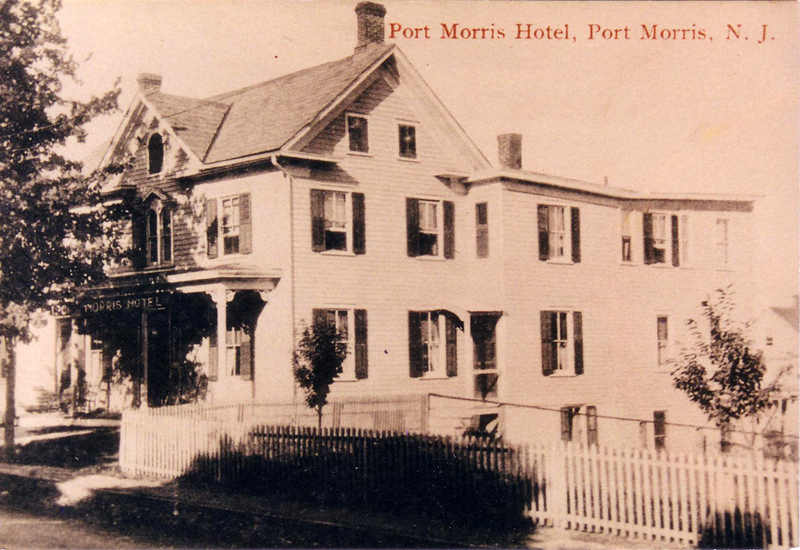 1867 -- Port Morris has just two residential buildings, including a large one that served as a Boarding House for Railway workers. Other structures are owned by the Canal Company or Railroad. Nathan Davis (b. 1818) buys land alongside the Railway and laid out a number of building lots. A train yard now starts to form, and in 1869 the oldest part of the Roundhouse was built by the Delaware, Lackawanna & Western Railroad Company, a company newly enlarged by it's takeover of the Morris & Essex Railroad. By 1869 there is a General Store and small pub alongside the Canal. 1871 -- William Grinder operates a pub adjacent the canal towpath. In October he is involved in an altercation with Hiram Foster, whom he accuses of stealing a bottle of whiskey. A chase ensues, and in a struggle, a small revolver goes off and Foster falls, mortally wounded. Grinder spends 10 years in jail and is released. 1873 -- The DL & W builds a row of 12 houses for it's workers south of the railroad tracks. These houses, along with the Roundhouse, would firm up the position of Port Morris as a major Railway hub in these early years. Eight of these houses still (2008) stand in their original location on Kings Highway. Great web site. I was home for a wedding and was doing an internet search and found your site. I skimmed through most of it. I have some info which I think should be included in the Port Morris history. I grew up on Kings Hwy which most people don’t know even exists. I lived at the second to last house on the dead end 1.1 mi long street. I left after joining the Marine Corps and my parents sold the house a few years after. The eight remaining houses that are at the end of the street were originally part of a group of 12. The houses were known as the 12 apostles. These houses were built in the late 1800’s for the support of the railroad. Each of the houses was built to house a family. There was also a church that was moved to Port Morris at some time, from my understanding. If you go down Kings Hwy (all the way to the end) you can still see the foundations of the houses that burned down and the church that was moved. The church was at the very end behind what we called the turnaround. There are 2 other foundations at the beginning of the eight remaining houses that was a 'bmx' [bicycle] track when I was growing up and one other one next to the eighth house. All of the eight houses have a true rock foundation. The frames of the houses are held together by wooden pegs. The house I grew up in was the second to last house which was [the home for] the original lead conductor for the train system. His house was built with an additional room over the kitchen in the rear of the house. All the other houses originally had a sloping roof over the kitchen. Kings Hwy also had a spring house which supplied water to the round house for a hydraulic for jacking up the trains. You can still see the remnants of both. The jack is on the railroad tracks and the remnants of the springhouse are at the top of the last hill before getting to the last eight houses. 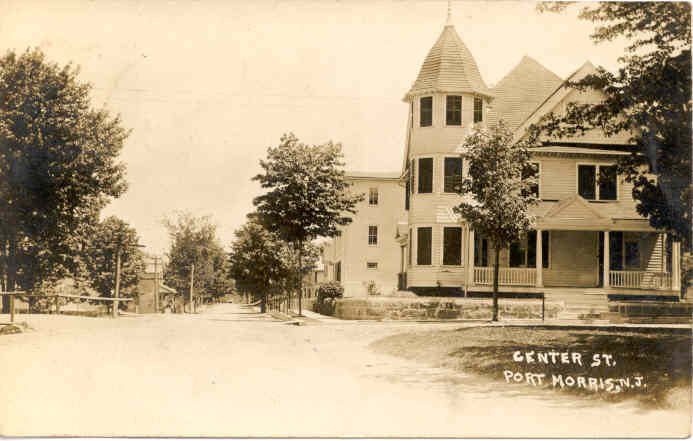 1875 -- On March 29, 1875 the Port Morris Post Office was established with Ira Mowery as Postmaster. Also in 1875 a Methodist Sunday School was organized for the children of the Railway Workers, numbering 20 students who met in a small building built onto the rear of the Railway Roundhouse. 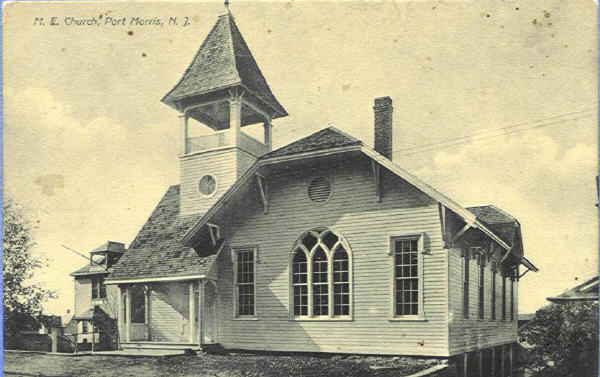 By October, Sunday afternoon services of the newly organized Port Morris Methodist Church began. Services were initially held in the same room used for Public School during the week. Within several years a separate Church building was constructed at the end of the row of 12 houses on Kings Highway. During this time, some residents attended the Presbyterian or Methodist Churches in Stanhope or the Baptist or Catholic Churches in Netcong. For many during this era, Church affiliation was often determined by national origin, with the Scots and English attending the Presbyterian or Methodist Church, Italians attending the Catholic Church, with the Baptist Church attracting a mix of those who embraced an evangelical Christian faith. 1877 -- Increasing numbers of Railway workers being crippled and killed on the job, coupled with a 10 percent pay cut led to a national Railway workers strike. 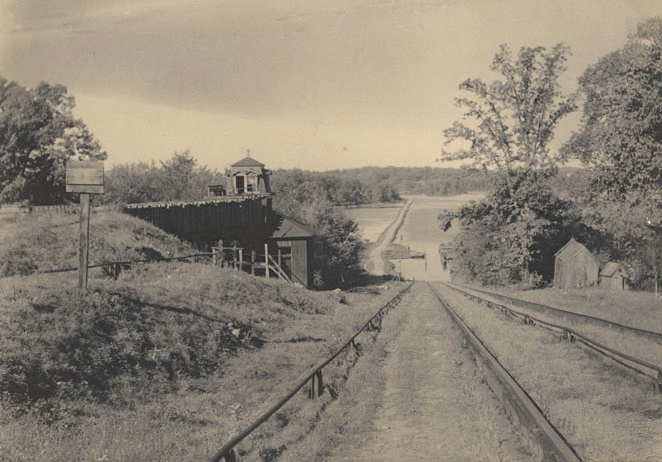 Militiamen are stationed in Port Morris to guard the Roundhouse and Railroad equipment after the strike grew violent in many places. 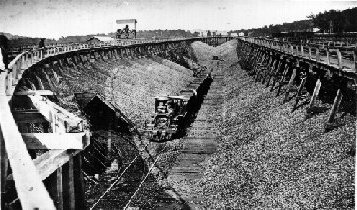 1880 -- During 1880 the amount of Iron Ore carried by the Morris Canal was 108,000 tons. With a boat normally carrying seventy tons, over 1,540 boat loads were needed to move this cargo. When you consider that the Canal did not "run" on Sunday and during the coldest part of the winter (frozen water), those 1,540 boat loads had to be moved over a span of less than 270 days, an average of over 6 boats of Iron Ore per day, beside all the other commodity boatloads. This was the last "big" year for Canal shipping. Things changed greatly in 1881 when much of the Canal Iron Ore business was lost when the Central Railroad of New Jersey took over the Ogden Mine Railroad and connected it to the Central's High Bridge Branch in 1881. Commercial shipping on the Canal would dwindle during the next 2 decades, the quicker railroads having taken much of the business. Port Morris would shift over these decades from being 'Canal-centered' to being 'Railway-centered'. 1880's -- Many Port Morris residents work in the Railway Industry as employees of the "Morris and Essex Railroad", which was later acquired by the "Delaware, Lackawanna & Western Railroad". A detailed 1887 map of Port Morris (above) shows a large Railway "Roundhouse". 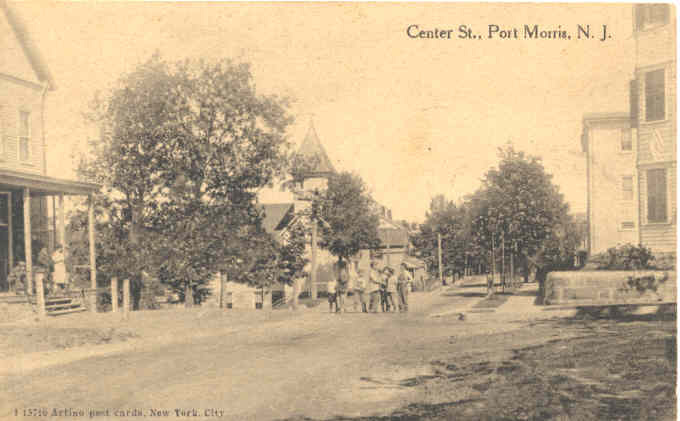 These two decades were a time of expansion and population growth for Port Morris, with an increasing number of stores, a Post Office and a school. In the early 1880's the New Jersey Central Railroad built a Passenger Station at Drakesville (modern day Ledgewood). Horse drawn carriages would then take people up the bumpy road to Lake Hopatcong. By 1887 the Landing/Lake Hopatcong Railway Station on the Lackawanna Line was built. 1891 -- A four classroom public Schoolhouse with a large basement was constructed on Center St. Over 60 students attended the first year. 1890's -- In 1892, a separate church building for the Methodist Church was built on the south side of the tracks, near the row of houses on Kings Highway, on land donated by the Railroad. Before long it was evident that most parishioners lived in the main part of town north of the tracks, and crossing a busy and soot filled rail yard in your "Sunday best" was far from ideal. In 1900 the railway gave permission to move the church building across the track yard of the Delaware, Lackawanna, & Western Railroad and across the Morris Canal. It was early winter and a freeze had formed a layer of ice on the Canal pond, over which the heavy building would be moved for 400 feet. In the midst of the days of moving, it warmed up and the water level of the pond suddenly rose over a foot, threatening to send the building to the pond bottom. A sudden cold snap firmed up the pond and saved the church, a sign, it was thought, of Divine Providence, an understandable lapse into Calvinism by the good Methodists. Once "safely on the other side", the building was remodeled and added to, with the dedication taking place on October 27, 1901. An 1895 Atlas listed the population of Port Morris as 233, but that probably failed to count the many transient Railway workers who lived in town. This era also saw the blossoming of Lake Hopatcong as the Summer Resort of choice by both the wealthy and the newly middle-class. People came to enjoy the cool "mountain air" afforded by the one thousand foot elevation of the Lake, a welcome summertime relief from the sweltering cities. Many would come up for the weekend and stay in one of the Hotels or rooming houses that sprang up around the Lake. Most everyone traveled to the Lake via Train, disembarking either at the Central Railway of New Jersey Station at Nolans Point or at the Landing Station of the Lackawanna Railroad. The great increase in Lackawanna rail traffic benefited Port Morris. 1908 -- The "New" Landing Bridge is completed. Built of stone and masonry, it continues to stand to this day. Trolley service came to Landing at this time. The Morris County Traction Company Trolleys come from Morristown, through Dover and up to the Lake. The tracks pass over the new bridge and run up Mt. Arlington Blvd. to the picnic & bathing park at Bertrand Island. 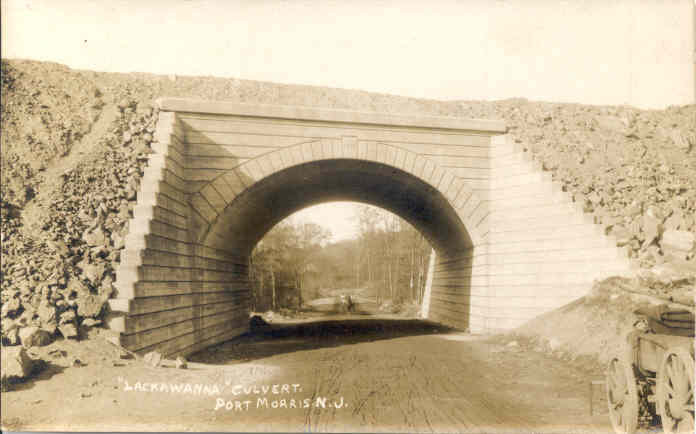 1910 -- The "Lackawanna Cut-off" is constructed across New Jersey in 1910, it is a Railway Engineering marvel, running on a level plane from Port Morris to the Delaware River. Instead of following the contours of the land, it uses massive amounts of fill, rock cuts and long bridges to traverse valleys, creating a level road to the Delaware River, cutting hours off the trip for the many trains coming in from the Anthracite fields of Pennsylvania, as well as passenger trains. Many immigrants from Italy had moved to the area to take advantage of the employment provided by this massive project. The two large arch bridges which still stand and cross Center Street in Port Morris are the starting point. Many new brick homes are constructed in Port Morris at this time, housing the conductors and other personal working on the increasingly busy Railroad. By this time commercial boat traffic on the canal had almost ceased, and weekend recreational boaters on the Canal became a common sight. An Ice House was operating on Lake Musconetcong at this time. Ice would be harvested in large sheets during the winter, stored in the Ice House and sold to fill residential & commercial Ice Boxes for a primitive refrigeration. With it's insulation, the ice in the Ice House kept even into the summer. It's foundations can still be made out on the lake shore behind the houses off Washington Street. 1922 -- The original 1891 Schoolhouse was partially destroyed by fire in January. 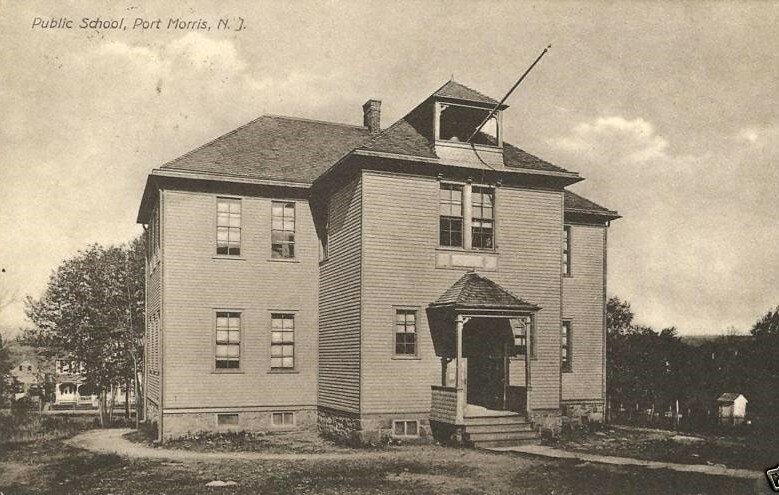 With a growing population in Port Morris, it was torn down and reconstructed in 1923 as a larger Elementary School on the same site with 8 classrooms, the Washington School. 1924 -- The formal shutting down of the Morris Canal, and the 'filling in' of the Canal bed. It's now "Canal Street". During the 1920's the rail yard expanded to it's largest size, with a semi-circle Roundhouse of 23 stalls equipped with a 90-foot turntable bridge to handle the mammoth Steam Locomotives. During this period, the nickname "Smokey City" was often applied to Port Morris, due to the frequent Steam Engine traffic in the train yard with their belching smoke stacks. 1929 -- A volunteer Fire Dept, the Roxbury Chemical Engine Co. No. 2 was founded in Port Morris. Do you realize that "Easter" is at hand? Do you realize how many hearts are broken on this account? Do you realize how hard its going to be for most people? Like me, for instance, I am a young girl of fifteen and I need a coat, so bad I have no money, nor any means of getting any. My father has been out of work for two years.
. . . My mother gets 'fits' when I ask her to buy me something new. Poor mother, I sympathize with her because it has been very hard on her, this depression, and having no money at all but debts piling up on us. I want to tell you something: We were once the richest people in our town but now, we are the lowest, considered, the worst people of Port Morris. For Easter some friends of mine are thinking of getting new out-fits and I just have to listen to them. How I wish I could have a least a coat. That would cost about $5.00 at least. I need a dress. I want one and it only cost $.79 cents. Dear Eleanor how I wish I had this coat and dress for Easter I would be the happiest girl. I love you so much. Please send me about $6.00. I thank you so much. 1941-1945 -- A total of 108 men from Port Morris served in the US Armed Forces during World War 2, of these, two men gave their lives. 1940's-1950's -- The post war building boom comes to Landing, with many homes built and older summer homes converted to year round use. During the immediate post war years, all Landing children attended the Elementary School in Port Morris. 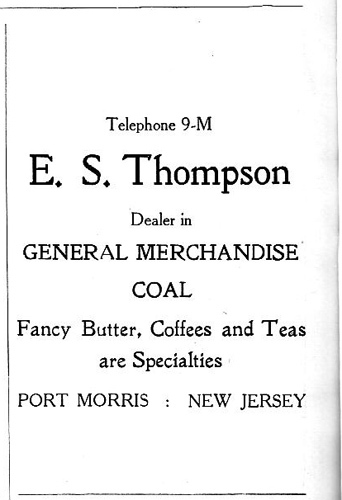 During this time there were a number of retail stores in Port Morris, including several grocery stores, a beauty salon. a shoemaker, a florist, as well as several automotive repair facilities. In today's world, you could order a flower arrangement on line from Avas Flowers instead of heading to a local florist. The Rail Yard continued to bustle along, with many Railway employees making their home here, although the amount of rail traffic through Port Morris steadily declined after World War 2. During this time the old Steam Engines were being retired, with Diesels taking their place. During the post war years a small Diner in an old trolley car opened at the corner of Palmer & Canal Streets, run by Ferpe DeFelice. Operating up thru about 1958, it was open 24 hours a day, staffed by various members of the DeFelice family and serving the community as well as Railway workers who came and went at all hours. A small bar & restaurant, Sargent's, operated at 350 Center Street, on the lower level facing Lake Musconetcong. Hi, I just came across your great web site. My father, Joseph Maline was born in the house on 234 Center St., Port Morris in 1927. His mother was Teresa DeMarino and his father was Michael Maline (who died in 1929 I think in a sand pit accident in Kenvil along with another Port Morris resident, I think a Henderson). My dad's uncles and aunts were the DeMarinos, Louis, Roosevelt , Pat, Sylvia, Nancy, Nick. He worked for the DL&W, Erie Lackawanna and Conrail railroads as a freight agent, ticket agent and various other positions. He was a volunteer fireman with the Roxbury #2 in Port Morris. He used to fish with Vic Valentino, and knew most of the guys from Port Morris. He used to hunt small game. He got a puppy one time from Joe Perfetti, but the pup was gun shy, so he was our family pet. I was born in 1950 and grew up in Port Morris, until we moved away in 1964. It was great fun growing up during the 1950's and living in Port Morris, where just about everybody was related or knew everyone. I remember having coal delivered to our house, getting our first TV, and walking to Joe Perfetti's store and DeMarino store to get bread, candies, and papers, and I remember Till the milkman delivering milk right to our door and putting it in the milk box on the front porch. The kids would always ask him for a piece of ice! Fishing and swimming in the Musconetcong River in the back of the house and all the kids jumping off the dock into the Deep Hole. We would fish at the Fire Lane on opening day of fishing. I attended Port Morris school, then the Roosevelt School. Remember the barber shop next to the school. I remember getting our mail at the post office/house from Dot DeMarino, our box # was 93! We would go to Bertrand's Island especially on Nickel Nights. I remember going up to the Roundhouse to get water in milk cans whenever the well would run dry. I can remember when sometimes some of the hobos that rode the trains, would come to our house and knock on the door and my mom would give them something to eat. I remember the outhouse (which was used for storage then)! Trick or Treating on Halloween was always fun and safe. You knew and trusted everyone. It was just great fun being a kid back then. No computers, Ipods, cell phones, or CD's. We kids knew how to have fun and used our imagination. We had record players and old 45's! Played things like hopscotch and hide and seek. I really enjoyed all your old photos and stories, especially from Sal Valentino. He did a great job of recalling the good ole days. Two questions: I have a pin from my grandmother with the letters PMSC and the date '36 hanging from a chain off the letters. I think it stands for Port Morris Social Club 1936. But I can't find anything about such a group. I was wondering if she was a member in 1936 and if there were records or photos. Does anyone know if such a social club existed in 1936? Also, does anyone know anything about a sand pit accident in the Kenvil area during 1929 (I'm not sure of the name of the company), several people who lived in Port Morris and worked at the sand pit were suffocated in this accident. I cannot find anything about this accident either. You can e-mail me at msladybambam@wmconnect.com. 1960's-present -- In 1961 a new modern Post Office for Landing was built on Lakeside Blvd. and in 1966 the Port Morris Post Office closed, residents are now served by the Landing P.O. In 1969 Nixon Elementary School in Landing was completed. With the completion of the new Landing school, Port Morris schoolchildren started moving over to Landing, and the old Elementary school in Port Morris saw its last class in June 1971. All this served to diminish the separate identity of Port Morris as it became subsumed into Landing in the minds of some. The opening of the large Landing Shopping center contributed to the eventual closure of most of the remaining Port Morris retail stores, with Joe's Market, a grocery and one of the last retail stores, closing in 1983. Several service businesses remain, along with a seasonal Vegetable Stand/Garden Center. Through the 1990's the Port Morris train yard had a series of renovations to become a Coach Yard for New Jersey Transit Commuter Trains. At present, Port Morris has about 1,000 residents. Even with all the changes, some remnants of the Port Morris of years ago remain, including several buildings along Center Street in Port Morris which were stores years ago, the elementary school, now converted to apartments, and the grand old homes that hearken back to the Railroad glory days of Port Morris. ©2003, 2017 LandingNewJersey.com. Some of the material here was newly uncovered by the Editor over a period of 10 years of researching local history using original source documents & interviews. Please do not reproduce or use on another website without permission. "IRON ERA", Newspaper of Dover, NJ, archive copies. "THE LAKE HOPATCONG BREEZE" - September, 1979. Waldron, Robert. Long time Port Morris resident and historic researcher, recorder of local oral histories. Arbolino, Jim. Netcong's Barber Extraordinaire !! The author also interviewed Port Morris residents Carole Santella Waldron, Millie Togno, Lester Guerra and Pat & Donald Beach. if you're in the northwest Jersey area we'll come and scan your images, no charge, and they never leave your possession. career back with Tampa in 2006. He lives in Florida where he owns a Restaurant and does Radio Commentary for Tampa Bay Games.